« Aer Lingus celebrate 75 years by bringing back the Peanuts! This entry was posted on May 29, 2011 at 6:00 pm and is filed under Brand Loyalty, Marketing, Uncategorized. You can follow any responses to this entry through the RSS 2.0 feed. You can leave a response, or trackback from your own site. Greg, I’d have to agree with a lot of that. My footballing loyalties were not left to chance where I grew up. I’d had older brothers, aunties and uncles waxing lyrical about the greats of Glasgow Celtic and how the Celts played football the way it was supposed to be played. The evidence was laid before me in the shape of the first “British” European Cup winner and in the shape of the legenadry figure of Mr Jock Stein. A very persuasive and convincing testimony was being set out for me. As a child i’d been gifted the usual football strips and pennants, I’d even been lucky enough to own a Jimmy “Jinky” Johnstone keyring resplendent in the world famous Hoops, so the product placement was ticking the boxes………… but the deal was sold for all eternity the day I was taken on my first pilgrimage to Celtic Park, under floodlights to see the Celts and King Kenny Dalglish, Danny McGrain etc etc…….I still have the scarf bought for me that night and it travels with me anytime we play in Europe. So, returning to your point, the advertising, the PR and promotions will only work so long as the brand experience delivers! I agree totally Steve and that’s easy to understand with the big successful teams but what about the Southampton fan, the West Brom, the West Ham fan and all those others who you come across the odd time!! Cheers & thanks for the great story ..
Great post. I have been supporting Manchester United for many years. 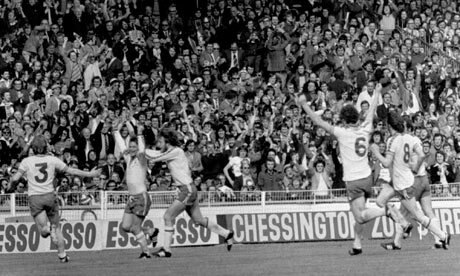 The FA Cup semi final in 1985 when Gordon Strachan scored was my earliest memory – the match was on RTE midweek and we were allowed stay up late to watch the end. United won the replay and the final. My father is a long serving Utd fan, my older brother grew up on Liverpool as champions of Europe, another brother supported Everton and my twin brother was handed the Arsenal jersey. I will be very interested to see who my nephew selects – he is four now. I think that sport allows boys and young men to talk to their fathers. It is always topical and is always a safe topic to discuss. It allows us to build common interests and that is the key to relationships. It allows the generation gap to be bridged. So in one sense soccer is about kicking a ball of air around the pitch, but in another sense it is much more important than that. How a business can build a fraction of that loyalty. I think that people can work out your values as a business. If you can convince your customers to recommend you to their closest contacts you are onto a winner. Great post Donnacha – does following a team allow us the ability to “belong” to a tribe? Is that a basic human need and does our teams from across the water achieve this for us? I guess as well it is an “investment” type of relationship – if you have followed results for years, defended them in the school yard, put on their shirt and dreamed about them the thought of changing is just unthinkable! – it is interesting .. Even though the rest of my family are reds… (my dad claims he supports Brighton and Hove Albion)… but I don’t take that very seriously. so you have your nan to blame! Brand loyalty is all about trust. Companies can instill that value by offering great products, awesome customer service, and the ability to do good in the community they serve. I find that some companies are even using prior customers’ experiences to build that trust (http://bit.ly/1NwG6qj).